If we are friends, in person or virtual, you know I travel *A LOT*. And if we are FaceBook friends (which means we really do know each other) you know that mostly I fly with my whole family of four. Jamie, Courtney, Cameron, and Myself. As a single traveler, your goal is First Class upgrades. This brings a much easier traveling VIP life. With over two million miles flown, I have been able to spend lots of time in the air, reading the fine print, and understanding Airline Mileage programs. I also frequently read Ben’s one Mile at a Time blog. It’s great reading and I can vicariously live through his first class travels in the air and five star hotels around the world. But that life is no longer for me. Cameron is 10, Courtney is 8, and I would much rather be with Jamie and them than somewhere on the road alone. His is my domestic first class now. I sit in the C seat, while they sit across the isle from me. What about the cost? Here is the best part, and the real reason for this post. Would you believe we all fly free, all year long? What? How is that possible? The answer is Southwest Companion pass. For me, hands down the best frequent flyer program ever. Period. No questions asked. You can read more about it, but the short version is, if you acquire 110,000 point (sometimes called miles) you earn this coveted Companion Pass. Jamie and I both have one, so any ticket we purchase, our companion comes along for free. Well. There is a $5.60/direction 911tax, but aside from that $11.20 round trip. It’s free. What about mine and Jamie’s ticket price? To qualify, we each needed 110,000 points. So with all those points we each have enough to buy free tickets on points. And Companion pass works for both paid and non-rev (award) tickets. Again the $11.20 fee applies. 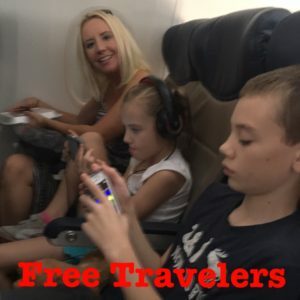 So it’s $44.80 for all four of us to fly round trip, anywhere southwest flies. As long as we have enough points. With the right search, and advance notice, we can buy tickets to Denver for 2400 points each way. San Diego hovers in the 5000 point range. Texas is around 8000, New York and Florida can be as low as 12,000 but are usually more. So mostly you’ll see us visiting the western US. Boise. Denver. Seattle. San Diego. San Francisco. And once in a while you’ll see is visit New York or Florida, or (like this week) Puerto Rico (which was about 13,000 points each direction). Another perk of Companion pass is …. You are qualified from the time you earn it, until the end of the next calendar year. So let’s say you earn the award in September 2015. Your companion award is good until December 31, 2017 a full 16 months. If by chance you qualified in January 2015, you would have almost a full two years To (ab)use the award until December 2016. Lots of people talk online about getting the pass, that once they get it, they are not able to use it as much as they thought they would. I can understand we are in a unique situation where all four of us are almost always available to travel. Unlike a business partner or spouse or someone with an in-office job. So the next question is ….. Where do those initial 110,000 points come from? With Jamie and I that’s a combined 220,000 miles. How could we possibly get that many miles, that early in the year? 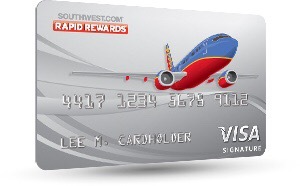 The answer is the Southwest Air Chase Visa, and Southwest Chase Business Visa. Each of these cards usually has a signup award of 20k or 30k points. If you qualify for both of these cards, that adds up to 40k or 60k points. Two or three times a year, the bonus points will rise to 50,000 points per card. That brings us to 100,000 points each. If you’re in the airport, there is almost always a Kiosk offering the 50,000 bonus points special. So THAT’S how we achieved two Companion passes, which essentially let’s us all four fly around the country for (almost) free all year long. This is how we do it! You can too. Here is a link to apply. In full disclosure of you use these links to apply for the card, I get get 5000 point referral bonus 😉 Hey, if you’re applying anyway, might as well use these referral links right? 😉 Thank you in advance. There are many other ways to earn points as well. I often look at Rapid Rewards Shopping for items I’m going to purchase anyway. I bought a suitcase on eBags.com and my laptop at BestBuy.com I was going to buy these anyway, same price, but because I entered the store via the Rewards shopping link, my spending $$ points were multiplied. In order to get hotel points, you usually need to book directly with the hotel. Instead we use Hotels.com and get 10% cash back, which is much greater than any other loyalty program out there. I should write a post on just booking hotels. We do book cars with Avis, and as a Southwest Partner, that comes with a 500 point bonus as well. So at the end of the day, we all fly free. Let me know in the comments if this works out for you. It would be great to know others benefited.